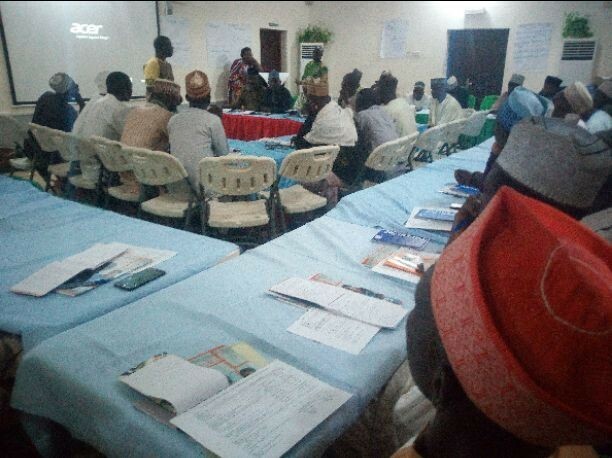 Participants at a 2-day capacity building for Community Based Associations (CBAs) in Kaduna North senatorial district on Community Development Charter (CDC) have described the charter as the way to go. They said CDC as a tool will help cover the existing gap between the government and its citizens especially those at the grassroots. They said this in different interview at the end of the 2-day workshop organised by Kaduna State Governance Implementing Partners (KSGIP) at a hotel in Zaria, Kaduna State Northwest Nigeria between Tuesday 28th and 29th November. A participant from Fagachi community, Kinkiba ward, Soba local government area of the state, Umar Shittu said, the training has taught him how to develop more community organizations in his community. “I have learnt a lot of things through idea sharing especially from the organizers and my colleagues from other communities. “I have learnt how to develop more CBOs. Before this training, me and others have travelled to Anambra state in August this year under Christian Aid’s V2P project in Kaduna. I discovered during that visit that, the State government use to talk with CBOs before coming up with its budget. This will also help us in Kaduna state. “We have gained a lot from these organizations working around governance. In my primary school for instance, Christian Aid through V2P project, 17 girls from a primary school in my community have benefited N45,000 each to keep them going in their education pursuits. I thank Almighty Allah and the organizers of this training”, he stressed. Another participant from Jamfalan community, Ikara local government, Ismail Bello, noted that, he has been equipped with knowledge to make sure that all the action plans designed by the State government towards ensuring effective implementation of 2018 budget in collaboration with community are followed. He said, “we know that, community people can come together, identify their top priorities and present the area that requires instantaneous response or intervention from government and not government dictating to us what it want to do for us. “We can now have our voices heard especially now that a charter has been developed for us. I just pray the state government will be sincere in following the filler from the community people and act upon such accordingly”. To Hussain Tukur Zabi from Sabon Gari local government, he has never attend such a workshop where so many things about budget processes and implementation would be broken down like this one. According to him, “I saw a lot, learnt a lot because I have never attend a workshop like this. I have learnt how to make the need of my community known to policy makers through budgeting. “So with this new knowledge, when I get back to my community, I will try my best to train my people so we know how to channel our right to using appropriate channel especially through budgeting. “So for this, God bless all of us including the organizers of the workshop that have put resources together for this capacity building. It is really an eye opener for me and I am sure, for many of us here”. Also sharing his experience with this correspondent, Community Development Officer, Zaria local government, Dalhatu Ibrahim Awai said, he has also learnt new things especially as regarding the spirit of team work and its effectiveness. He said, “I learnt the importance of working together as group. I also learnt how to mobilise in communities to identify their first need. Having done that, they have to prioritize that is, to pick the most importance need and forward it to CDC”. Commenting on the workshop, the Executive Director, League of Democratic Women (LEADS-NIG) Barrister Rebecca Sako-John, said the unprecedented turn out of the participants showed that, people have beginning to develop interest in budget processes and tracking to their advantage. She was optimistic that, “they will be helping the government in promoting good governance which will in turn helping themselves and their communities. We hope they will put into maximum use what they have learnt during these two days”. The collaborating partners for the training are Mobilizing for Development (M4D), Action (SCEEP) Aid, Christian Aid project in Kaduna called V2P, Partnership to Engage, Learn and Reform (PERL) and Planning and Budget Commission (P&BC).